What is the Most Recognized Yoga Instructor Certification? When looking to start a career, the right qualifications are important. So, what is the best yoga instructor certification? Keep reading to find out. Do you dream of helping people reach their yogi potential? Do you love spending time in downward dog, triangle and other stretchy poses? Then a career as a yoga instructor is an excellent path for you! And good news – getting your yoga instructor certification is easier than ever before. With online and in-person options, you can find the best program that fits your current lifestyle. When choosing a certification, however, it’s important to know which ones will help you land a job at your favorite yoga studio quicker. 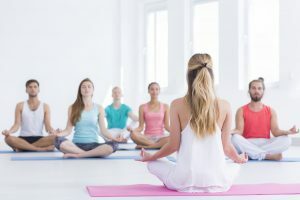 This guide will show you everything you need to know about getting a yoga instructor certification as well as the most recognizable programs to consider. Maybe you’ve been doing yoga for years and see it as a viable career path. Or, maybe you simply want to learn everything you can about the practice. Everyone has different reasons that lead them to want to get a yoga instructor certification. While becoming certified may seem like the next natural step in your yoga journey, it’s a step to take seriously. Like any certification, degree or career move in general, there are many important elements to consider. First off, let’s go over what it will take to earn a yoga instructor certification. Becoming a yoga instructor wasn’t always such a technical process. It used to be that yoga was more of a discipline, a practice that a guru handed down to the student. The guru, or teacher, determined the student’s readiness based on their maturity and knowledge of the discipline. The student was then granted teacher status. They could then pass on their knowledge of yoga to the next generation of students. No official qualifications or certifications were required. In the past 15 years, however, there has been quite the yoga boom. Yoga’s rise in popularity has caused the standards to change. With yoga teachers and studios popping up everywhere, becoming a yoga instructor is not as relaxed as it once was. But jumping into a yoga training association is hard work. Here are a few things you may consider before deciding if a yoga instructor certification is right for you. Anyone can be trained to teach yoga. No matter what level you’re at, how good you are or how much you know, you can become a yoga instructor. Don’t feel like you need to be an expert. However, you will want to have a certain amount of experience practicing yoga before enrolling in a certification program. There is no certain requirement here, and amount of experience and readiness varies for everyone. Having at least a good year of dedicated yoga practice under your belt is a good starting point. A year gives you enough time to develop your own yoga practice and experience before undergoing the direction of teachers. Over time, yoga will transform your body and strength. Your yoga styles and preferences for poses may change as your body changes. Taking the time to allow this transformation to happen on your own is important. Additionally, yoga comes with spiritual and physical transformations. Allow these changes to happen before getting involved in a training program. Before enrolling in a yoga instructor certification program, get clear on your intention for doing so. Why do you want to become a yoga instructor? Do you feel like it’s a deep calling, or is it possible that this is just an impulsive phase? Yoga certification programs can be intensive. Having deep motivation is what will carry you through to the finish. Your reason for enrolling should come from your own desires rather than following the trends of friends or family. Does This Work for Me Financially? People don’t typically become a yoga instructor for the money. The average base pay for a yoga instructor in the United States is $37,900 per year. It’s important to consider whether a yoga instructor certification program will be worth it in the end. It can cost as low as $1,000 and as high as even $10,000 to earn certification depending on which program you go with. Whether you choose to make teaching yoga your full-time job or a part-time side hustle, consider whether the ROI is worth it. You may have options for financing your program. Some course providers may allow you to pay tuition in installments. Some may even off scholarships, so do your research before shelling out. Timing is key to getting your yoga instructor certification. If you already have a lot going on, understand that this may not be the right time for you to pursue becoming a yoga teacher. You’ll want to be fully committed and able to focus on your training. Is the Yoga Lifestyle Right for Me? Yoga is not all stretches and poses. The practice is a philosophy and a lifestyle. This way of life relates not only to physical practice, but to your moral and spiritual values. Breathing, meditation, self-actualization – these are all elements of the yogi lifestyle. It’s about finding balance and harmony in all areas of wellness. While no one is perfect, you may want to work on your healthy lifestyle before committing to a yoga instructor certification program. What areas of your well-being need more work? Just because you love practicing yoga doesn’t necessarily mean you’ll love teaching it. Before enrolling in a certification program, understand what to expect as a yoga instructor. It may seem like a dream career, but like any job, it comes with its downsides. On one hand, you get to practice yoga all day, meet new people and be a healthy leader to influence change. On the downside, yoga instructors have an unpredictable schedule. You may have to work weird hours, teach classes before dawn or after dinner, and work on the weekends. You may also work at various locations to make ends meet. It can be hard work to build your reputation and start filling your classes. These are important things to understand. If you’re still on board, keep reading to learn how to choose the right certification program for you. There are plenty of options out there for yoga certification, so how do you choose? Here are a few different ways to go about a training program. If you want to immerse yourself in the study and get to teaching right away, 3 or 4-week intensive programs may be the best choice for you. You might find an intensive program that takes place Monday through Friday, or an intensive retreat-style program. An intensive program can be a great way to learn new skills in yoga. The 4-month training is a good midway option between intensive programs and longer ones. If you can’t quite give up your day job yet and have at least a year to get your yoga instructor certification, the 4-month training is a great option. Training takes place during the weekday evenings and weekends. These longer trainings allow you to make a gradual transition to becoming a yoga instructor. This gives you time to adjust to the lifestyle. With more attention in the philosophy and science of yoga, year-long training programs help you gain more knowledge and insight into the practice. Plenty of online certification programs exist to help you earn certification on your own schedule. Especially if you have little ones at home or don’t have access to a training center, online programs are the way to go. If it’s the right time for you, you have the finances and your intention is set, which certification is best to invest your time and money in? Yoga Alliance is an international nonprofit, the largest in the world for representing the yoga community. They have over 72,700 registered yoga teachers and more than 4,800 registered yoga schools across the world. Yoga Alliance accredits 200-hour teaching programs. These include a minimum of 180 hours of time with teachers as well as 20 hours of home study. As long as these requirements are met, you can choose to take either the intensive route or a long-term training path. This organization offers scholarship programs for students. Additionally, it offers a community for teachers to build their business, learn from others and celebrate the diversity of yoga styles and traditions. It encourages safe yoga instruction for all who wish to earn their certification. The ExpertRating Yoga Instructor Certification is a premium international certification that is recognized by hundreds of employers and government bodies in the US and other countries. This is an affordable opportunity to pursue a career as a yoga instructor in a way that is flexible for your schedule. Choosing to pursue yoga instructor certification is a big deal. Be sure to consider whether it’s the right time for you and whether it will meet your expectations. Then do your research to find the best program for you. And if you’re ready to get started with an affordable online yoga instructor program, enroll in ExpertRating Yoga Instructor Certification today! Previous PostPrevious What’s a Good Salary for a Life Coach? Next PostNext How to Launch an Online Personal Trainer Business?